The hardest thing about buying a luxury timepiece is ensuring that it is in all actuality a luxury timepiece. Truly, it doesn’t matter if we’re talking Rolex, Chopard, Ebel, even Swatch for Kids… there is perhaps no product in the history of consumers that has more fake replicas than the watch business. The internet, meanwhile, has been around long enough that we’re all well aware of the benefits to shopping online. But when it comes to something that has a strong history of being replicated and faked, online shoppers have a right to be cautious. That’s why The Watchery takes such pride in all of their watches being 100% new. These authentic timepieces all have serial numbers, one of the biggest identifiers on a legitimate designer timepiece. But what’s more is that they are BBB Accredited. When shopping for a timepiece online, being accredited by the Better Business Bureau provides customers with a peace of mind that is utterly underrated. BBB issues Reliability Reports on all businesses, whether or not they are BBB accredited. The Watchery Corp., meanwhile, has been accredited by the Better Business Bureau since June of 2007. And currently they have been rated as an A+. In case you never went to grade school, we’ll let you know that there is no possible better ranking than an A+. Does A Chopard Change Your Life? Henderson seemed to understand those feelings, opening with “It may sound slightly manic and a little mad to insist that wearing one of the world class Chopard Watches on a person’s wrist will change their world,” and, well, yeah, it was. Now, as I previously mentioned, we enjoy Chopard watches and their original designs as much as the next guy. And we will agree that donning a magnificent eye-catching luxury watch can do wonders for an individuals self-esteem and feelings of self-worth. But to suggest a Chopard will change your life, or that it could change your view on life more than any other watch brand, like an A. Lange & Sohne or a Baume and Mercier, is bordering on the delusional. 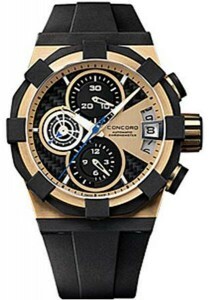 Concord Watches – They Got Stones! As we have previously mentioned, The Watchery offers a tremendous selection of brand name luxury watches, including (but not limited to) IWC, PArmigiani, Chopard, Ebel, and Baume & Mercier. However, one of the most popular (if not the most popular) has always been the timepieces created by the Concord Watch company. Though the Concord Watch Company was started back in 1908, they didn’t become the world-wide watch-power they are today until after the first World War. Perhaps not coincidentally, this was about the same time that the pocket watch began to go out of style, instead being replaced by the wrist watch, which was used by soldiers in combat. Whatever the reason, the conclusion of World War I was the time period in which Concord watches began to take off. While their quality was always sublime, Concord was now being recognized for some of the eye-catching gems found in their pieces, such as sapphires, rubies, emeralds, and of course, diamonds. 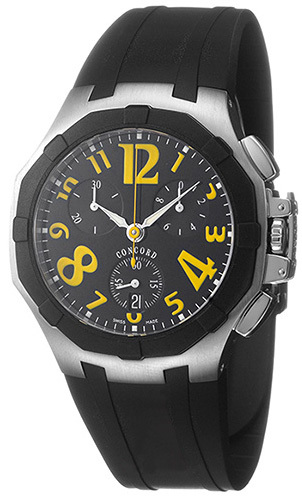 To this day, the Concord Watch company is celebrated for their careful selection of diamonds. In fact, each diamond selected is specifically chosen for its connection to the timepiece it is intended to be used for. We are not suggesting that any Concord watch is far-and-beyond better than the timepieces made by Chopard, Ebel or Baume & Mercier. We are suggesting, however, that if you are looking for an elegant luxury timepiece that will feature precious stones, there is no choice that can top Concord. One of the most impressive parts about shopping for watches through The Watchery is their impressive number of brand name companies. This list includes, but is not limited to, Breitling, Cartier, Tag Heuer, Ebel, Concord, JeanRichard, Parmigiani, Baume and Mercier, IWC, and Raymond Weil. The full list of brand names being offered at The Watchery is much larger and more extensive, and is available for viewing on their official website. The full list is very impressive, and we have zero intention of taking away from that. If you have got a specific watch in mind, The Watchery is your best place to find it, especially with their quick find and advanced searching options. However, sometimes these brand names aren’t all that different… or at the very least, their origins aren’t. Did you know that it is actually the Movado Watch company that designs, manufactures, and distributes Ebel watches, as well as Concord, ESQ, Coach, Hugo Boss, Lacoste, Juicy Couture ad Tommy Hilfiger? That’s right, all those brand name watches are designed and distributed from the same placr. By no means should you compare a Concord timepiece to the $5 Juicy Couture watch impulse-buy for your youngest niece at the counter on Gap Kids. But who designs a great number of these watches is an intriguing thing to notice. And it certainly makes their slogan more noteworthy, doesn’t it?